Fractional CO2 laser resurfacing is an advanced cosmetic procedure that offers the latest in facial rejuvenation. Designed to take years off someone’s skin, this technique effectively turns back the clock on sun damage and other related skin imperfections. Dr. Potyondy uses a fractional laser manufactured by Sandstone (now Ellman). Combining the well-established quality of carbon dioxide lasers with new, fractional technology and a more focused beam, it is able to target brown spots, age spots, sun damage, fine lines, wrinkles, acne scarring, discoloration, pore size reduction and other skin issues, all at the same time, through a single one-time resurfacing procedure. In terms of long-term benefits, this treatment is made to create an overall improvement in skin texture and firmness, as well as better collagen production. As people age, their collage production typically declines, leading to a less attractive and youthful appearance over time—but fractional CO2 laser resurfacing can do something about that. It works especially well for people with significant wrinkles around their eyes, mouth or forehead, as well as those with shallow scars from previous acne damage. Fractional CO2 laser resurfacing can be performed on its own as a standalone surgery or in conjunction with another cosmetic procedure. While CO2 laser resurfacing has been around for years, used to treat various skin issues like wrinkles, scars, warts and similar conditions, fractional CO2 laser resurfacing is a newer procedure. 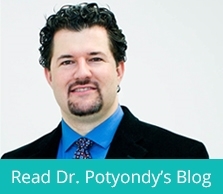 Not everyone is the right candidate for this treatment option, so consulting with Dr. Potyondyis important in order to determine whether or not the procedure is a right fit for a specific individual. After a patient is deemed a good candidate they are given local anesthesia at the treatment site to remove potential discomfort (or, if it’s a particularly large area being treated, higher levels of anesthesia may be necessary). Then, the doctor uses short, pulsed light or continuous beams of light to scan the skin to remove thin layers. These columns of fractionated energy are essentially vaporizing skin at the surface level, without causing major heat damage, in order to clear away problem spots and reveal fresher, brighter skin. While every patient is different, recovering from fractional CO2 laser resurfacing tends to take between a few days and a few weeks. Because the ultra-pulse technology is designed to remove skin with minimal heat damage, recovery is often complete within two weeks. This is a big improvement as compared to traditional, full-field resurfacing, which removes the whole surface area of the treated skin, requiring a much longer, less comfortable recovery period. By using fractional laser treatment, physicians are able to treat only the fractions of the treatment area that are necessary, causing less impact to the tissues and making for faster recovery. The beauty of fractional CO2 laser resurfacing is that it offers improved skin texture and appearance, with minimal downtime or discomfort for the patient. While there is a healing period after treatment, patients walk away with a reduced area of damaged skin, lessened fine lines and wrinkles, the removal of age and sunspots, new collagen production and an overall younger appearance. What’s more, they enjoy these fresh-faced benefits with minimal downtime, usually returning to normal activities within 5 days and completely recovering within two weeks or up to a month. Potential patients interested in fractional CO2 laser resurfacing can meet with a qualified surgeon or dermatologist to have their skin examined and know if this procedure could be an effective option.